Coffee tour guide and Barb at one of the lakes. Me in front of the coffee processing museum. German founder’s plaque above me. 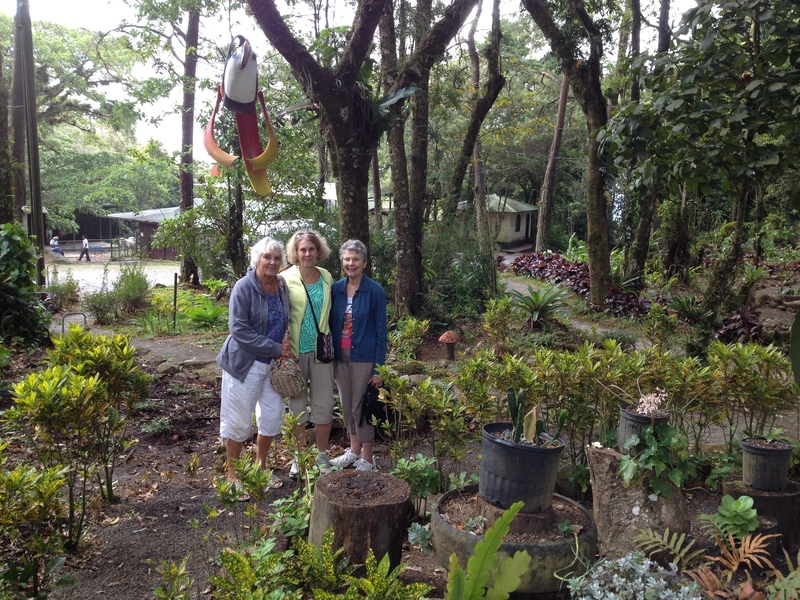 Carol, Barb, and I under the tired toucan in garden at Selva Negra . Yes, it is made out of a tire. 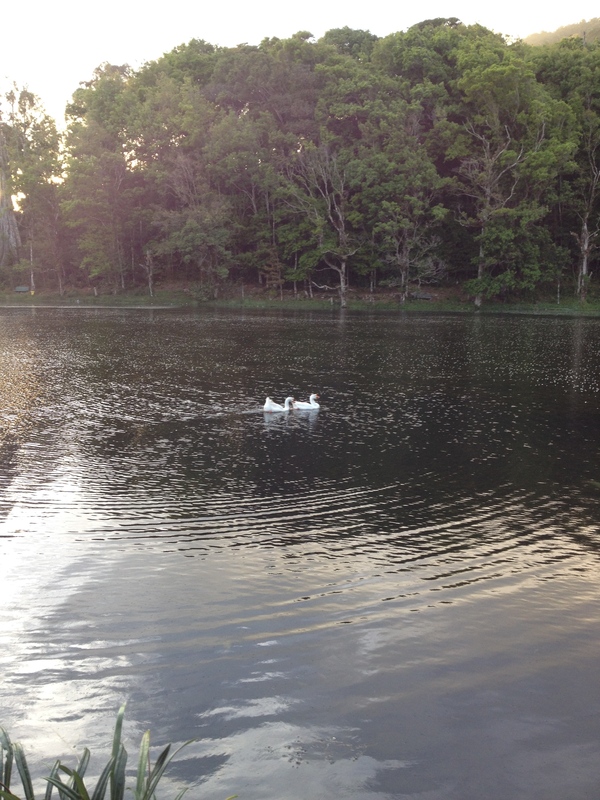 Geese on pond across from our cabin at Selva Negra. For those of you who are geographic terminology challenged–and I include myself here–Nicaragua calls their politically defined areas Departments. In the US they are called States. Not sure what these territories are called in other countries. Remember, I did say I was geo challenged. I finally got out of Managua and Rivas to see some of the Northern Departments that were hit hardest in the wars of the 70s and 80s. In my last blog, I talked about the trip to Estelí. 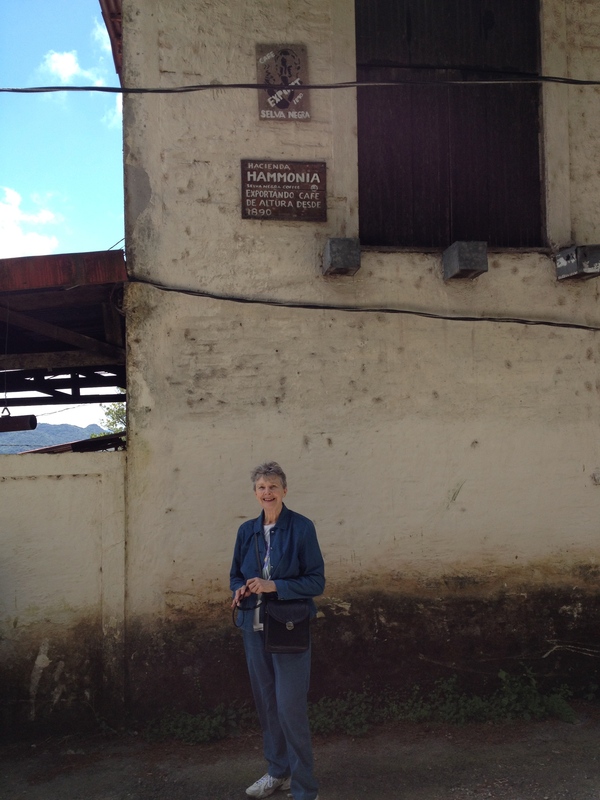 March 13th Barb Wisley, Carol Dorsett and I set out for the Department of Matagalpa to the capital city Matagalpa. This time I took my car and drove since I figured that this city couldn’t be nearly as bad as Managua to drive. I actually had a purpose for this trip. I was invited to visit the Clinica Fara, a large NGO clinic funded and run by the Fara Foundation out of Austin, TX. www.farafoundation.org. I was introduced to this clinic by a US doctor who lives in San Juan del Sur and for whom I consulted for a clinic he is helping to start outside of San Juan del Sur in Tortuga. I was especially interested in Clinica Fara because they have a specialty for wounds. After many emails back and forth and so many coincidences of people–the founders of Fara Foundation have a home in Rancho Santana that I have known for eight years, the home not the people–we ladies decided to stay at a small hotel around the corner from the clinic. The hotel had a locked parking area across the street from the hotel where I could leave the car without concern. Estancia Don Roberto was a comfortable place that served complementary breakfast but also had a bar for us weary travelers when we arrived. The owner of the hotel took me to Clinica Fara to introduce me to the administrator, Marcela Cisne-Zadik, with whom I had been communicating. What a warm welcoming I received from Marcela and the medical director Dr. Freddy Espinoza Cruz. They were excited about my returning to be shown the clinic and to work the following morning with Dra. Ruth Rocha, the wound care specialist. The hotel owner gave us a good recommendation for dinner, Brava Toro, in the downtown area to which we could walk. The restaurant was across from the river that runs through town. We were directed to sit on the patio of the third floor for a great view of the city and surrounding hills which are called mountains. Dinner was great, the walk was perfect and we stopped at the Cathedral on the way home to find Mass going on. I had forgotten it was Lent and this is a very Catholic area. We were informed the next day that during the floods several years ago that ravaged Matagalpa, the river rose to the third floor of the restarant where we were sitting. Pretty amazing. No wonder that there was so much death and damage during that flood. The next day the three of us gals got a full tour and history of Fara Clinic. Then I went to work with Dra. Ruth Rocha while the other two gals, who by the way are also nurses, went shopping. Dra. Rocha is a beautiful, young, and dedicated wound specialist. We saw four lower leg venous ulcer patients that had the largest wounds I have seen in a long time. Dra. Rocha is making progress however. She has, more than the actual care, taught these patients to be compliant by returning to the clinic for treatments. These four patients came to the clinic from great distances. It was truly a loving experience for me in so many ways. I spoke Spanish with Dra. Rocha so as not to offend the patients. AND I introduced her to AminoPlex, the wound care spray that I call a miracle maker. Dra. Ruth said she will keep me abreast of how AminoPlex is working as she continues to use it on these patients. Marcela invited us all to lunch at her mother Marlene Cisne’s 100 year old home not too far away. Marlene has a most beautiful garden that deserved many photos in Carol’s collection. During out brief visit, Marlene and Marcela told us many stories of their lives during the war. Survival and forgiveness were the dominant themes. Indeed, Only Love Prevails, for sure. 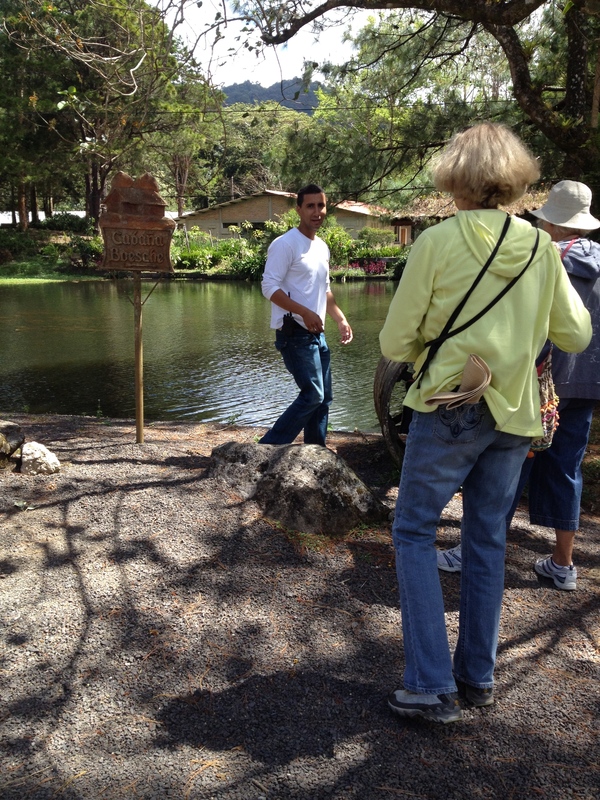 Saturday morning after a hearty breakfast, we and seven others, took a tour of the coffee plantation. Our guide spoke perfect English and was most knowledgeable about the flora and fauna of the area as well as the production process of coffee itself. At the end of the tour, we taste tested four different freshly ground coffees–two of them from Selva Negra. Of course, we all ended up buying coffee beans in the gift shop. Selva Negra produces its own meats, eggs, and cheeses. The chef at Rancho Santana actually buys cheeses from Selva Negra. Sunday after breakfast and checking out, we headed more North to Jinotega to buy fruits and vegetables from the roadside farms. The drive from Matagalpa to Jinotega is beautiful. The hillside farms are amazing and beautiful. We did indeed buy fruits and vegetables. A new fruit to the three of us is naranjilla. We tasted the juice for lunch at Marlene Cisne’s. The fruit looks like a yellow persimmon but it is a member of the tomato family and when on the bush, it is hairy like a kiwi. We all bought some of the fruit that were polished of their fur. Each of us made our juice when we returned to our homes. I am savoring mine in the smoothies I have been making with the ton of fresh parsley that I also bought on the roadside. The roads to the North are very good and Empieza–my car’s name–is a real pleasure to drive. Not exactly a Mercedes but great for here. The other really good news for me is that I obtained my Nicaraguan driver’s license last week. The last step in my totally legal status will be to get the car registered in my name at the police in Rivas. I’ll work on that next month because I will then have to pay tax on the car for the purchase price, $24K. All in all, life is good. My health remains good. I am doing my TRX system exercises at least three times a week. Now that I’ve stated this, I better stick with the program, eh! My commercial property project is on hold to get the title straightened out legally. The West Sacramento house is still on the market and I am visualizing an older couple buying it for the disabilty conveniences and ability to eat your meals from your own yard. My potted plant garden here isn’t doing too well. I think I loved the oregano to death but the basil has one little sprout still holding its head up and getting taller. Hopefully in my next blog, I will have figured out how to insert photos where I want them. If I wanted perfection this time, you wouldn’t be reading a thing.